​Finishing touches enhance and complete all window treatments; these include swags & cascades, soft valances or hard valances, popularly known as pelmets or cornices. 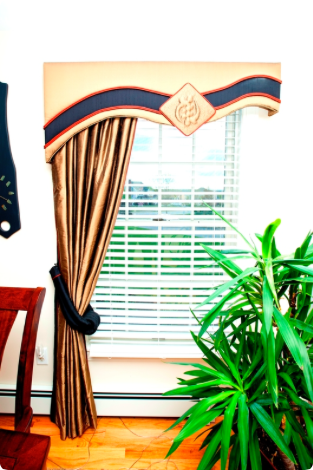 ​Generally valances are much softer than cornices/pelmets and are usually gathered in some way. They add an instant presence to your windows, whether paired with curtains or used on their own, and provide interest without blocking the view. 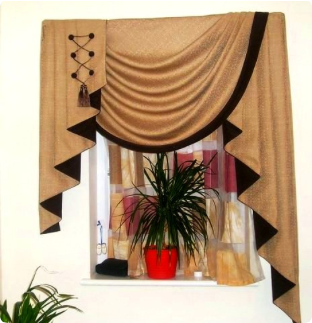 This type of treatment requires more fabric than a cornice as it usually requires some fullness - but not as much as curtains, so you could treat yourself to a valance made from an expensive designer fabric, whilst complementing economical curtains and drapes. Like cornices or pelmets, valances can be shaped along the bottom edge, softening the rectangular window shape, as can the top edge, though with some restrictions. These can be board mounted or dressed on a decorative rod or pole. ​Are you ready to fall in love with your home all over again? Then let’s talk cornices! These are one of the most versatile types of window treatments – comes flat, board mounted, can be shaped, pieced and slightly padded in your chosen fabric. For added design detail, you could choose to have a contrast border or emphasize the shape with braids, fringes or even simple welting. ​For the ultimate impact, Swags & Jabots is the way to go. Although considered quite traditional, the use of modern fabrics and trimmings brings them into the 21st Century.